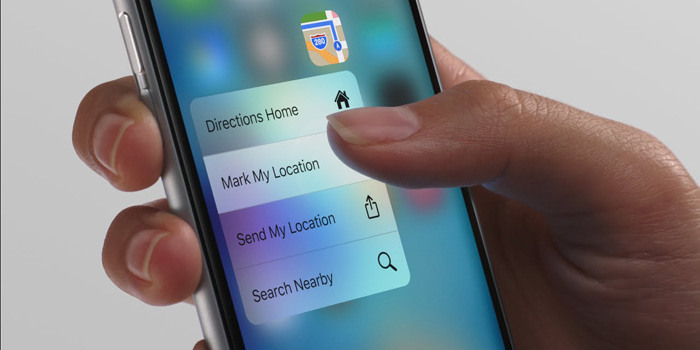 Apple's 3D touch feature was first introduced with the iPhone 6s and 6s Plus which utilizes capacitive sensors integrated directly into the display. The purpose of 3D touch is to optimize the user's experience with their iPhone or iPad and can be compared with a PC's keyboard shortcuts which make certain tasks easier. To utilize the 3D touch function, you must have the iPhone 6s model or later. Lets experiment by locating the "Maps" app on the iPhone's home screen. Once you have found the app, press it firmly. You will find yourself presented with a widget associated with that app providing some shortcuts for quick use. The 3D touch function works with any app on the home screen although some apps from the app store will only give you the option to "Share" it. But addition to enhancing your home screen access, you can also perform 3D touch functions inside certain apps. Within the "Messages" app, you can 3D touch (firmly press on) a conversation to sneak peak the text you received without sending a "read" receipt to the person on the other end. From within the "Phone" app you can use the 3D function under the "Favorites" tab to get quick options such as "Message, Call, Video, Mail, etc.". Many people forget that they have 3D touch on their iPhone. But once you explore its functions and utilize its capabilities to their full extent, your iOS experience will be enhanced.